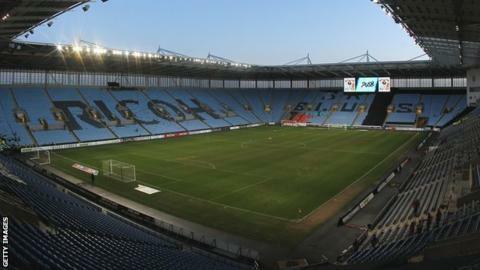 Coventry City say they intend to leave the Ricoh Arena at the end of the season, having been unable to agree a new deal with landlords Wasps. The Sky Blues are now weighing up two other groundshare options. But City, who spent a season playing 'home' games at Northampton in 2013-14, are yet to satisfy the English Football League Board over next season's plans. An extraordinary general meeting on 25 April has been convened, with expulsion from the league still possible. The League One club had been warned that a meeting would be called, if they did not have concrete plans by 2 April as to where they would be playing their home games next season. A statement issued by the EFL on Thursday said: "The EFL board is still to receive a definitive application from Coventry City in respect to where the club plans to stage its home matches in the 2019-20 season. "An EGM of clubs has been convened to consider their expulsion from the league on 25 April if they are unable to satisfy the EFL board. "The EFL understands that it is the club's preference to extend their stay at the Ricoh Arena for future seasons and this would meet the EFL's ultimate objective of ensuring they continue to play in the city of Coventry on a long-term basis. " City subsequently put out their own statement, stating that, although they would prefer to stay in the city, they are moving ahead with with plans to play elsewhere. The statement said: "The football club have confirmed to the EFL that it is close to the head of terms stage with two groundshare options. "While it remains our number one priority to stay, we can confirm that unfortunately the Ricoh Arena is not one of the venues above." BBC Coventry & Warwickshire reported last week that the club's owners, Sisu, have identified the site of the former Woodlands School in the west of the city, which closed in July 2016, as a location for building a new stadium. But the club needs somewhere to play on an interim basis. The club statement added: "At this stage, Wasps continue to choose not to enter into talks with the football club, while our owners Sisu continue legal action with Coventry City Council. "Regrettably, we therefore have had to make alternative plans to the Ricoh Arena, the stadium that was built for us, to ensure our place in the EFL next season. "It is not an easy situation, and we apologise to supporters that it has reached this stage and for the heartache which has been caused. "Coventry City FC and its management team cannot affect the stances of Coventry City Council, Wasps or of our owners in this situation. "What we can do is put in plans to ensure this football club continues to survive despite the impasse that exists."